Moments after line 304 bus crashed en route to Jerusalem, passengers extricate themselves from the vehicle. 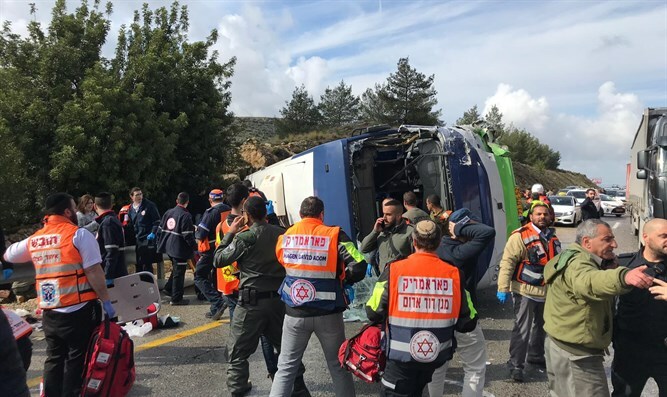 Two people were killed and 41 more injured when a bus from the Kavim company’s 304 line from Modiin Illit to Jerusalem flipped over Sunday morning on Route 443. The two women killed in the accident have been identified as sisters from the city of Modiin Illit. Police say the crash took place shortly after another accident on the 443 in the opposite direction, and may have been a factor in the bus accident.